p = kruskalwallis(x) returns the p-value for the null hypothesis that the data in each column of the matrix x comes from the same distribution, using a Kruskal-Wallis test. The alternative hypothesis is that not all samples come from the same distribution. kruskalwallis also returns an ANOVA table and a box plot. p = kruskalwallis(x,group) returns the p-value for a test of the null hypothesis that the data in each categorical group, as specified by the grouping variable group comes from the same distribution. The alternative hypothesis is that not all groups come from the same distribution. p = kruskalwallis(x,group,displayopt) returns the p-value of the test and lets you display or suppress the ANOVA table and box plot. [p,tbl,stats] = kruskalwallis(___) also returns the ANOVA table as the cell array tbl and the structure stats containing information about the test statistics. Create two different normal probability distribution objects. The first distribution has mu = 0 and sigma = 1, and the second distribution has mu = 2 | and |sigma = 1. Create a matrix of sample data by generating random numbers from these two distributions. The first two columns of x contain data generated from the first distribution, while the third column contains data generated from the second distribution. Test the null hypothesis that the sample data from each column in x comes from the same distribution. The returned value of p indicates that kruskalwallis rejects the null hypothesis that all three data samples come from the same distribution at a 1% significance level. The ANOVA table provides additional test results, and the box plot visually presents the summary statistics for each column in x. Create two different normal probability distribution objects. The first distribution has mu = 0 and sigma = 1. The second distribution has mu = 2 | and |sigma = 1. Test the null hypothesis that the sample data from each column in x comes from the same distribution. Suppress the output displays, and generate the structure stats to use in further testing. The returned value of p indicates that the test rejects the null hypothesis at the 1% significance level. You can use the structure stats to perform additional followup testing. The cell array tbl contains the same data as the graphical ANOVA table, including column and row labels. Conduct a followup test to identify which data sample comes from a different distribution. Note: Intervals can be used for testing but are not simultaneous confidence intervals. 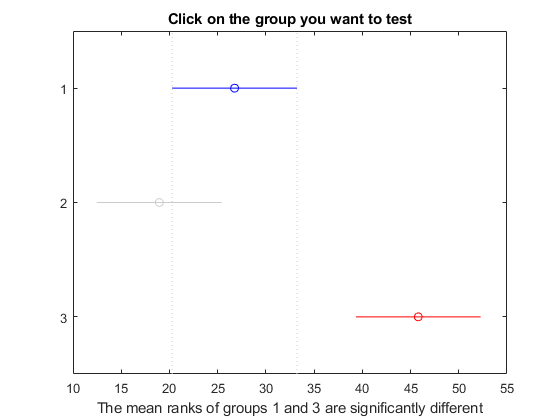 The results indicate that there is a significant difference between groups 1 and 3, so the test rejects the null hypothesis that the data in these two groups comes from the same distribution. The same is true for groups 2 and 3. However, there is not a significant difference between groups 1 and 2, so the test does not reject the null hypothesis that these two groups come from the same distribution. Therefore, these results suggest that the data in groups 1 and 2 come from the same distribution, and the data in group 3 comes from a different distribution. Create a vector, strength, containing measurements of the strength of metal beams. Create a second vector, alloy, indicating the type of metal alloy from which the corresponding beam is made. Test the null hypothesis that the beam strength measurements have the same distribution across all three alloys. The returned value of p indicates that the test rejects the null hypothesis at the 1% significance level. Sample data for the hypothesis test, specified as a vector or an m-by-n matrix. If x is an m-by-n matrix, each of the n columns represents an independent sample containing m mutually independent observations. Grouping variable, specified as a numeric or logical vector, a character or string array, or a cell array of character vectors. If x is a vector, then each element in group identifies the group to which the corresponding element in x belongs, and group must be a vector of the same length as x. If a row of group contains an empty value, that row and the corresponding observation in x are disregarded. NaN values in either x or group are similarly ignored. If x is a matrix, then each column in x represents a different group, and you can use group to specify labels for these columns. The number of elements in group and the number of columns in x must be equal. The labels contained in group also annotate the box plot. An ANOVA table containing the sums of squares, degrees of freedom, and other quantities calculated based on the ranks of the data in x. A box plot of the data in each column of the data matrix x. 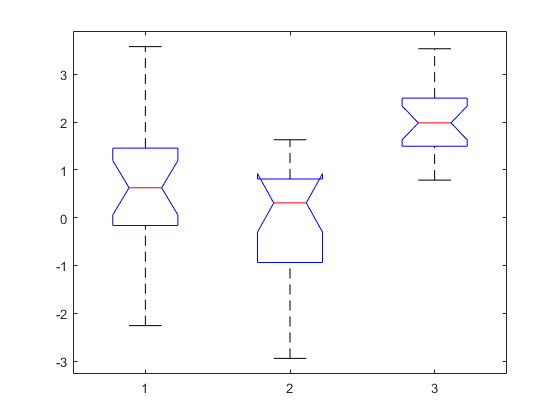 The box plots are based on the actual data values, rather than on the ranks. If displayopt is 'off', kruskalwallis does not display these figures. If you specify a value for displayopt, you must also specify a value for group. If you do not have a grouping variable, specify group as . ANOVA table of test results, returned as a cell array. tbl includes the sums of squares, degrees of freedom, and other quantities calculated based on the ranks of the data in x, as well as column and row labels. Test data, returned as a structure. You can perform followup multiple comparison tests on pairs of sample medians by using multcompare, with stats as the input value. The Kruskal-Wallis test is a nonparametric version of classical one-way ANOVA, and an extension of the Wilcoxon rank sum test to more than two groups. It compares the medians of the groups of data in x to determine if the samples come from the same population (or, equivalently, from different populations with the same distribution). The Kruskal-Wallis test uses ranks of the data, rather than numeric values, to compute the test statistics. 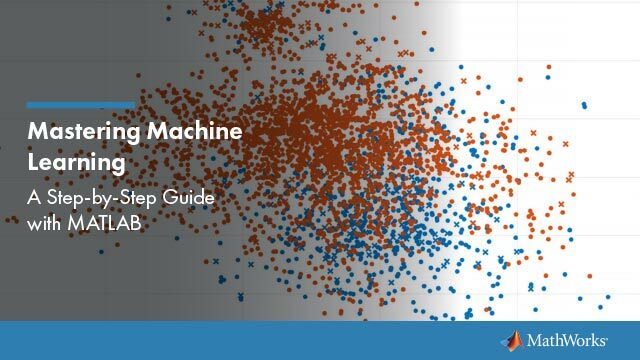 It finds ranks by ordering the data from smallest to largest across all groups, and taking the numeric index of this ordering. The rank for a tied observation is equal to the average rank of all observations tied with it. The F-statistic used in classical one-way ANOVA is replaced by a chi-square statistic, and the p-value measures the significance of the chi-square statistic. The Kruskal-Wallis test assumes that all samples come from populations having the same continuous distribution, apart from possibly different locations due to group effects, and that all observations are mutually independent. By contrast, classical one-way ANOVA replaces the first assumption with the stronger assumption that the populations have normal distributions.